Forget today’s brand-curated Spotify playlists, designer t-shirts emblazoned with feminist slogans but made in sweatshops, and how biscuits know what’s empowering right now. This International Women’s Day – and every other day – four women will travel from Northern Ireland to access abortion elsewhere, because they don’t have the right to free, safe, legal, local care at home. Unlike the rest of the UK, where the 1967 Abortion Act is in place, Northern Ireland abides by archaic, outdated laws (the 1861 Offences Against the Person Act) that prohibit terminations in most circumstances. It makes for grim figures – only 12 legal abortions were carried out last year in NI. It also makes for harrowing stories and experiences, shared by people who must dredge their own trauma again and again for the cause, for people to listen and stand up. People from Belfast to Brighton, Derry to Derby, Newcastle NI to Newcastle-upon-Tyne should be trusted with the choice. This week, DUP leader and former first minister Arlene Foster picked up the Female Politician of the Year award – a disgrace really to award any accolade to the leader of an anti-choice, anti-LGBTQ, hateful party that has sent the government into a record-breaking shutdown and opposes any change to laws around reproductive rights. Last year’s repeal of the draconian abortion laws in the Republic of Ireland brought the plight of those in Northern Ireland further into the spotlight – citizens of NI, who can have dual citizenship of Ireland and Britain, cannot make use of the vital rights their counterparts have. Travelling to access abortion can be traumatic, a domestic, financial and emotional strain. Northern Ireland is a pro-choice country – Amnesty International found 75 per cent want a change to the law. Here are ways that you can actively help the cause. It’s vital to amplify the voices and work of people on the frontline of the abortion rights movement in Northern Ireland. Follow activists, journalists, charity organisers, and pages that share experiences and stories. They’ll be the people shouting about the issues that don’t make it to the front pages, using the right language, politics, and demands that are necessary. Much of the discourse of contemporary feminism – and by extension, International Women’s Day – centres largely on personal experiences. While that’s important too, to move upwards and evolve we have to think of the most marginalized people around us, and lift up their struggles and direct action. If you’re able to, get out on the streets. Women’s Strikes are taking place across the world today, and over the course of the weekend. Bring a sign – ‘you’re not a vessel’! 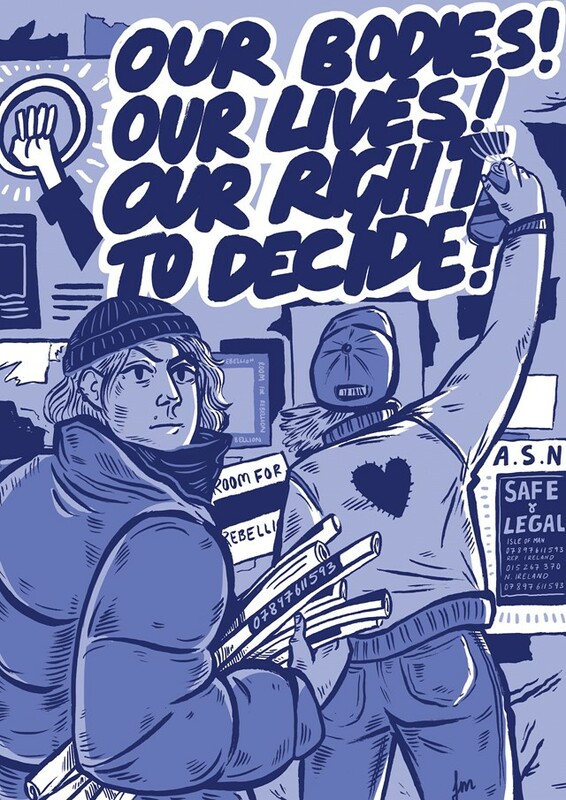 ‘Our bodies, our lives, our right to decide’! ‘#NowforNI’! – and go to a demonstration. Last week, 28 people – including British MPs and the cast of NI-based TV series Derry Girls – dragged 28 suitcases across London’s Westminster Bridge to highlight the numbers that leave NI each week to travel to England and Wales to access terminations. In those suitcases were the names of 62,000 people who demand decriminalisation. This weekend in Belfast will see a huge gathering of activists and organisations at a rally calling for abortion reform. In London on Saint Patrick’s Day, the London-Irish Abortion Rights Campaign will be represented at the parade. If you can’t, the URL world needs you too. Follow the #NowforNI hashtag and make noise, Thunderclap when groups ask, post a photo when you’re travelling with your #HealthcareNotAirfare luggage tag, contact your local MP for solidarity, and share the petitions for law reform. Right now, Northern Ireland has been without a functioning government for over two years – a pretty horrendous world record. It’s affecting the passage of any new laws – including a domestic violence bill, policy on gender pay gap reporting, and mental health-related strategy – and creates a barrier for any change via a stagnating Stormont (NI’s parliament) for change to laws around abortion access. You can email your MP with a handy template from bpas demanding for solidarity and change. While Northern Ireland remains in a period direct rule from the British government, it’s more important than ever to have British MPs on side. Stella Creasy has been a major ally, tabling conversations in the Commons and helping to put through policy that gave NI people access to NHS-funded care. MPs like Labour’s Creasy and Diana Johnson, the SNP’s Hannah Bardell have been vocal about the issue, ask your MP to do the same. Don’t let the government shirk its responsibility for a large proportion of its citizens. The current system and care excludes some of the most marginalised people in society – people of colour, disabled people, migrants, poor people. Follow intersectional pro-choice groups, and make like Irish feminism and get trans inclusive. Trans men can get pregnant, and are forced to travel too. 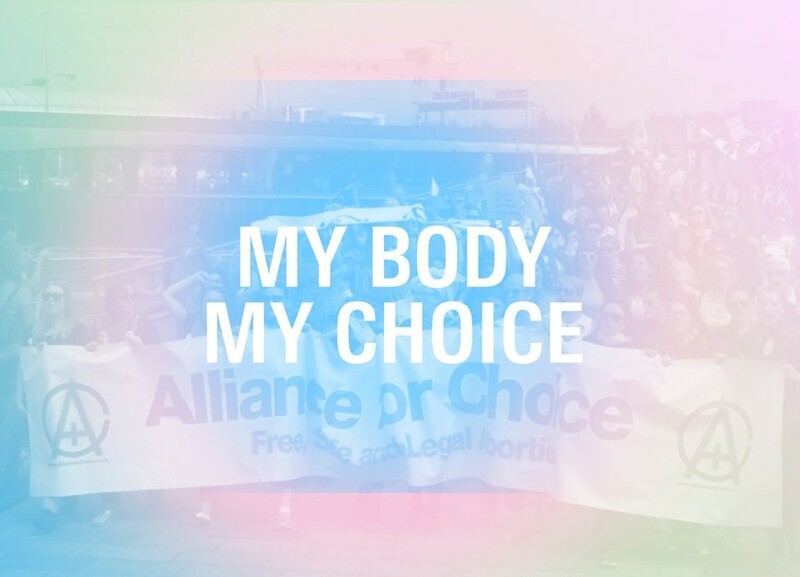 Alliance for Choice, a Northern Irish activist organisation, worked tirelessly alongside the Repeal the Eighth campaign to bring abortion rights to the Republic of Ireland. They have, since 1996, been campaigning for reform in the North. Recently, the group worked with local musician Isobel Anderson on “I’m a Life”. The song and accompanying music video tells the very real story of a woman who has to travel to England for an abortion. The lyrics reference a real testimony from a woman named Janet, one of 4,284 women who travelled from across Ireland in 2015. It’s moving, and a galvanizing call for change. Anderson sings: “I have only one regret, and that that’s I had to travel far away and go through it all alone, the hardest way, but I am not alone in my choice, and it’s a choice I don’t take lightly. There are many others who have taken this journey like me. The group will be attending the Belfast rally this weekend. You can also support them by buying their very lovely merch. Other organisations and groups continue to do the good work –the #NowforNI campaign, Amnesty International, Speaking of Imelda, the Abortion Rights Campaign, and Room for Rebellion are just some. The current news cycle can be pretty fatiguing, so faithfully following the cases and experiences that do make the press is important. There’s currently a Northern Irish mother challenging her prosecution for providing her daughter with safe but illegal abortion pills, and the brave Sarah Ewart recently began her High Court challenge to change the NI law, after being denied an abortion in 2013. Travelling to access abortion can be a very real financial strain. Though NHS-funded care was made available to people from Northern Ireland for the very first time in 2017, it’s still costly when considering flights, accommodation (many have to stay overnight during the process, or risk miscarrying on the flight home), or childcare for some, and other issues. Abortion Support Network is a small but vital charity that provides funding for people who reach out to them, from places like Northern Ireland, Malta, and Gibraltar. People get creative in how they support ASN too, from marathon runs to club nights. "I can't have a baby that will tie me to this monster forever" ~ Alica, a former ASN client who became pregnant while in an abusive relationship.